In this file photo, police investigate after an elderly man walked into a North Long Beach salon and said he'd been shot on Thursday, Aug. 30, 2018. Photo by Thomas R. Cordova. An elderly man who was bleeding from a gunshot wound walked into a North Long Beach nail salon to ask for help Thursday morning. The man, who is in his 70s, went into the shop at Long Beach Boulevard and East Market Street shortly after 10 a.m. and asked someone to call 911, according to an employee and another local business owner. 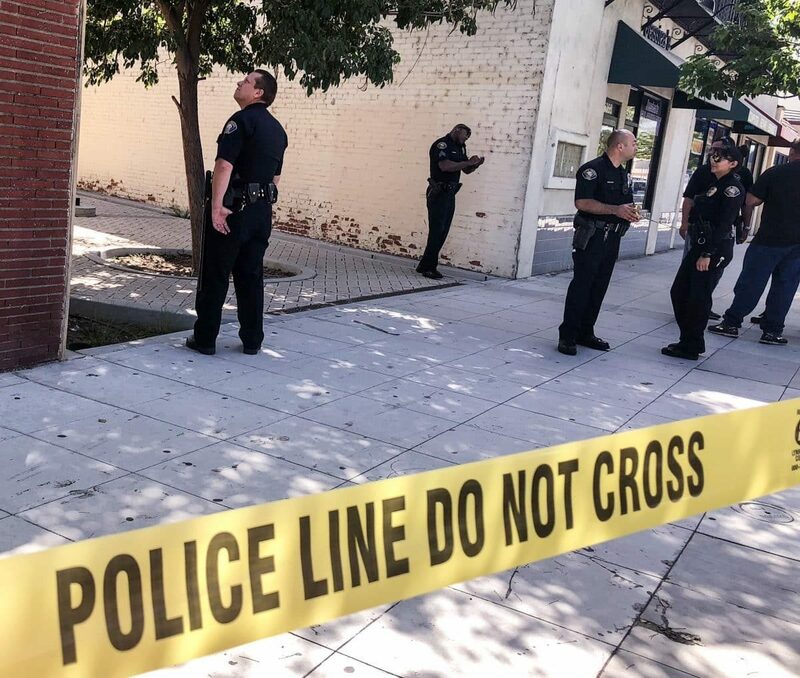 The man said he’d been sitting in a walkway area with benches and trees between two nearby buildings when a bullet hit him, Gloria Marquez, the owner of a beauty salon on the same block, said. The man, who often walks around the area, said he didn’t see who shot him, according to Marquez. “Who would want to shoot him? He’s always just quiet and nice,” she said. Paramedics quickly took the man to a local hospital. It looks like he’ll survive the wound, according to police. Marquez said she’s the one who called 911 after a nail shop employee came into her store and told her what happened. It looked like the bullet hit the man in his abdomen, she said. John Matthews, a neighbor who lives in apartment above one of the nearby businesses, said he heard the shot ring out, but he thought it was just traffic noise until he saw the police arrive. Simpkins said she checked her security cameras for any footage that could help police, but she couldn’t find anything. Police asked anyone with information to contact investigators at 562-570-7370. Anyone who wants to stay anonymous can submit tips to Los Angeles Regional Crime Stoppers by calling 1-800-222-TIPS or visiting lacrimestoppers.org.